So, with the eight stores it now has open in the U.S., and the two upcoming ones in Naples and Costa Mesa, that will make ten De Beers stores in the U.S. And, as Penny has noted previously, the goal is to get near 50 worldwide by the end of the year. 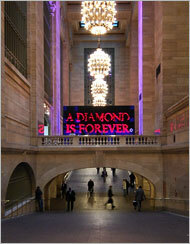 – On the “innovative” front, the company hopes to do more things along the lines of the big “A Diamond is Forever” made of roses it installed earlier this year at Grand Central Station (which has a little cameo by the Forevermark, “used under license.”) You can see pictures of the exhibition here and here. The idea is apparently while flowers die, a diamond is forever. ”That was hugely successful for us — it generated a lot of interest and PR,” Sussens says. – The company also plans to do more online advertising, including buying search engine keywords, as well as email advertising and online banners, all designed to drive people to adiamondisforever.com. Sussens says “Drive Home” was one of the best testing Christmas commercials the company’s ever done. – It will also continue its “Seize the Day” outdoor and print and “countdown” print campaigns.